Can a ship with a 'Magic Carpet' persuade young travellers to take a cruise? Celebrity Edge - The Magic Carpet spans 16 storeys on the ship. This picture also shows the raised hot-tubs in the pool area and the running track. 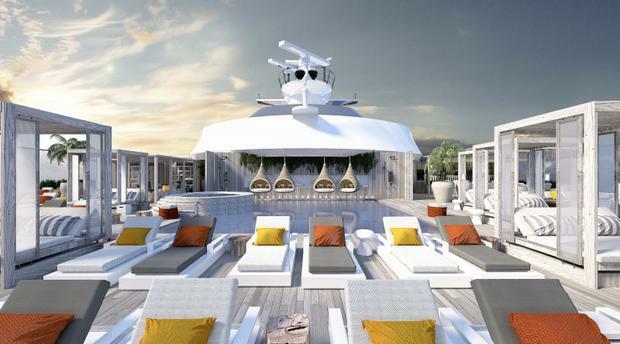 Promising “timeless luxury” and an “intimate journey”, Celebrity Cruises’ newest ship - launching next year - promises to be a “home from home”. 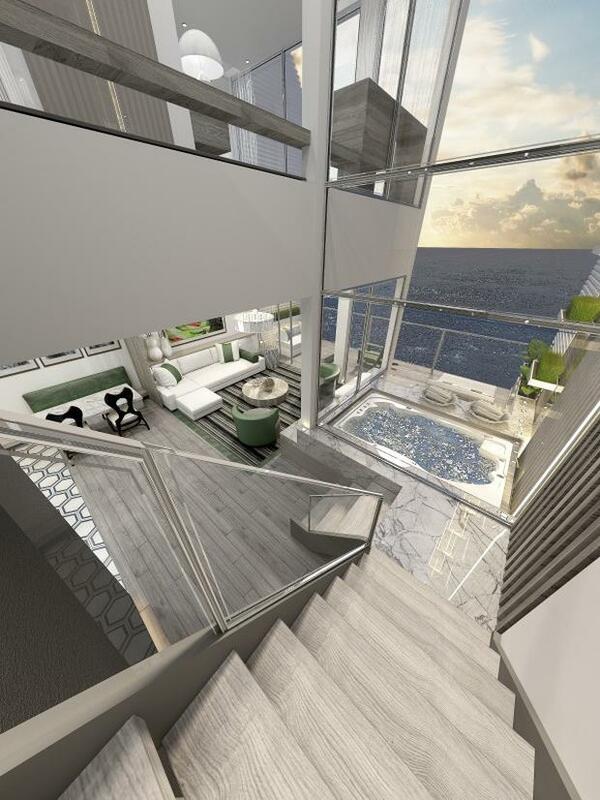 That's according to British interior designer Kelly Hoppen, the brains behind Celebrity Edge's sleek and chic interiors. The new state-of-the-art ship will be based in Europe from May 2019, sailing from Southampton and visiting Barcelona and Rome, following a maiden voyage on December 16 2018 and winter season in the Caribbean. Bookings are now open. “One of the main reasons I was drawn to this project was the challenge of doing something that's never been done before, which, given that I've been doing interior design for 41 years, is hugely attractive,” Ms Hoppen said. Among the most notable innovations are cabins with “infinite verandas”, that allow guests to merge their balcony and living room at the touch of button, expanding the space all the way to the water’s edge. She added: “Creating a real home from home, wherever you are in the world, was the most important focus for me, because the home is where you are most comfortable. I also wanted a space that embodies timeless luxury, rather than a trendy vibe. The ship’s most groundbreaking architectural feature to be revealed so far is the Magic Carpet – a platform that slides between the decks. At its lowest position, it becomes an embarkation station called the Destination Gateway. Raised to Deck 5, it becomes an al-fresco dining space; at its highest level it's a restaurant called “Dinner on the Edge”. The ship's design is the work of British architect Tom Wright, who also designed Dubai’s Burj al-Arab, shaped like a dhow sail, which bills itself as the world’s only seven-star hotel. Other innovations on Celebrity Edge include Eden, a 7,000 sq-ft restaurant spanning three decks along the rear of the ship that it is claimed will have more exterior glass windows than any other room at sea. The ship’s modern interiors and high-tech architectural features, more of which will be unveiled in the coming months, hope to “open up a whole new world of travelling” to a different group of travellers, including younger passengers. “There is no other cruise company that is truly breaking the mould, in terms of cruise ship design, and turning the industry on its head,” said Lisa Lutoff-Perlo, president and CEO of Celebrity Cruises. And will this new group include Ms Hoppen? “I've never been on a cruise - it's just never been on my radar - but also partly because on a cruise, you won't necessarily have all of the comforts you might have in a hotel or your home, such as a powerful shower or a particularly comfortable bed,” she said. 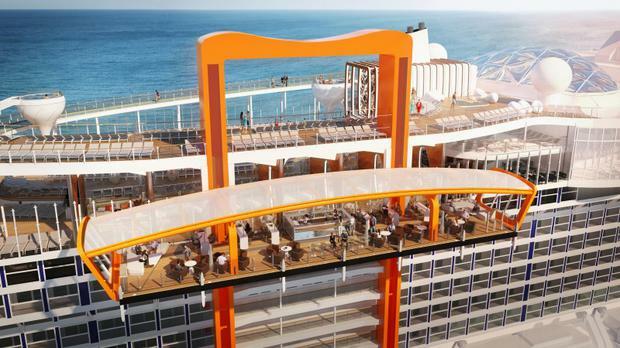 Celebrity Edge will be launched next year from Fort Lauderdale, Florida. 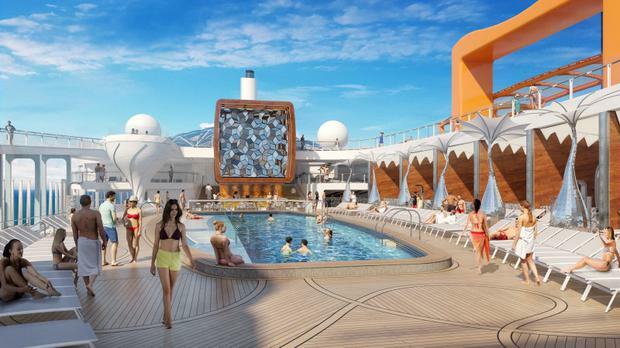 The city's cruise terminal is getting a $75 million (€64 million) facelift to welcome the new ship, new renderings of which were unveiled this week. Its first two seven-night itineraries will include visits to San Juan (Puerto Rico), Tortola (British Virgin Islands) and Philipsburg (St Maarten) in the eastern Caribbean, and Key West (Florida), Costa Maya and Cozumel in Mexico, and George Town (Grand Cayman) in the western Caribbean. For its 2019 summer season, Celebrity Cruises’ fleet of five ships will sail through Europe, with stops in 27 different countries, overnight stays in 16 cities, and visits to more than 90 destinations, including three new ports of call: Nauplion (Greece), Rijeka (Croatia), and Santa Margherita, the Italian seaside town near Portofino. Pól Ó Conghaile Free Wi-Fi, spacious suites, an 'Instagram wall' and enough literary quotes to fill a small volume... welcome aboard the new W.B. Yeats "cruise-ferry". Pól Ó Conghaile Wanna get paid over €2k per week to visit glaciers in Alaska, go white water rafting in Norway or ride an urban zip wire in Dubai? Pól Ó Conghaile We've had waterparks, surf simulators and 'Ultimate Family Suites' with twisty slides connecting stories. What can cruise ships possibly offer next? What are the best cruises for 2019? Think all cruise ships are the same? They're not. How can solo travellers skip the single supplement on a cruise?